This can be a new experience for your users.Because it is difficult for anyone to comment on your article.It's easy to give a response rather than a comment.You can add reactive buttons for this.It is a simple and quick response.You can see it in social networks like Facebook.Here is very simple way to add reaction buttons for blogger using vicomi.com. 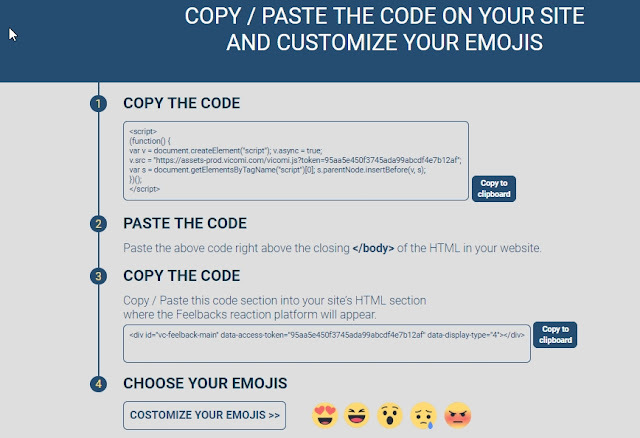 Next, choose Get the code for HTML website. Now sign up with your website, email and your password. Paste the copied code right above the closing </body> of the HTML in your site. Then copy the next code again. Finally save theme and enjoy reaction buttons. So you know about How to Add Reaction Buttons for Blogger Blog, Hope you like the post, don’t forget to share it with your friends and leave a comment below if you are facing any problem at any step in the method discussed above.Thank you.